It was a dark and stormy night; the rain fell in torrents — except at occasional intervals, when it was checked by a violent gust of wind which swept up the streets (for it is in San Jose that our scene lies), rattling along the housetops, and fiercely agitating the scanty glow of the street lamps that struggled against the darkness. The staccato tapping of the ever-changing droplets, for some were heavier than others and hit with greater vigor against the double-paned windows brought forth, by turn, awe at the power of nature and respectful contemplation of the numinous peace and tranquility these rainy winter evenings produce while I, your author, who is the subject of this tale, curl up with a volume penned by Edward Bulwer-Lytton and the ice gently clinks as it floats and bumps against the side of a cocktail glass filled with Gosling’s Dark Rum and ginger beer. And so begins our newsletter. Have no fear that Hail Pelicus will be in Las Vegas to report on the goings on and daring dos of this event. Recognizing the prestige not only of Northern California Rugby but the humble organ that reports on it, we have been granted our media credential and we have already secured one promise of a high level interview and will seek out more scoops. If we have to stay up until 4am at a craps table to get the story for you, our loyal readers, then that is what we here at Hail Pelicus will do. No need to thank me, just give me some money. Well played physical game. Both sides were relatively focused and in good form. Obviously the score was close, which meant both sides were well matched up. Baracus had the advantage in the scrum, which ultimately helped them win with a late push over try from 5 meters out. Well contested match played in good spirits on a beautiful San Francisco afternoon. Lots of rookies made continuity difficult but there were some great phases of play and strong defense. Score was tied at halftime and well into the second half. Sacramento’s experience showed with two late tries for the final score. The day was overcast and cool. The ground held up pretty well in the face the deluge of the night before. UCSC Women were gracious enough to travel to Fresno to play. UCSC had closed their campus fields due to their flooding. A sentiment I agree with, and one that sums up the game nicely. After the excessive amount of rain recently, it was nice to be able to play on a field in such good condition. Both teams contested the match well, and it was much closer than the score indicated. There was no incidence of misconduct, but Stanford was consistently not rolling away, something that I failed to call correctly. Overall, a great day for rugby. Close, well contested game. Very heavy field conditions. I arrived at Santa Clara University after a journey lasting nearly an hour and a half, as Highway 17 was closed northbound due to a massive landslide earlier in the week. So I was Monterey bound on Highway 1 to Watsonville and Highway 129, not trusting if 152 was open, east to US Highway 101, and then north all the way to the De La Cruz exit and SCU. The 10 AM kick off was a bit earlier than usual, but the men were playing UCSB later that afternoon. The air had a chill and the skies were partly cloudy as both teams warmed up at 9:30. Santa Clara has had issues getting enough players on the pitch for games, and this one wasn’t an exception: 14 were ready to play, as two on the sidelines were still deemed injured, though one was kitted-out. Nevada-Reno had their starting 15 and another six or seven subs on the bench. Santa Clara kicked off then short a player, but within a minute had gained possession of the ball and started marching down the field, with some crisp passing as players were tackled, and some quick ruck ball when a player was taken to ground; a penalty was awarded to them from an offside at a ruck, and tight-head prop Mariela Murillo broke through for the first try of the match, near to the posts, that she easily converted for a quick 7-0 lead. At 15 minutes inside center Rachel Schneider, back in action after missing the UCSC game, scored a try from loose play, again converted for a 14-0 lead. Nevada-Reno countered quickly, when a loose ball was recovered in mid-field and Teagan Cammarano scampered her way to the goal line for 5 points, cutting the margin to 14-5. After that try there was no more scoring until late in the half, when flyhalf Kira Clifton of the Wolfpack crossed the goal line near the posts for a converted try. The half would end 14-12 in favor of the Broncos. Several players were caught making high tackles, and therefore warnings went to both teams to be aware of their tackling. As an aside, I told the Nevada captain to have her players not question calls, as a Santa Clara restart after one of Nevada’s tries ended up bouncing right on the blue dashed line when it appeared it would fall short of the required ten meters, and one of the visitor’s players yelled out that the kick was short, to me directly, as play continued on and as Santa Clara recovered their own kick off. Santa Clara scored right from the second half kickoff, some 30 seconds into the half, as Carly Fowler received a pass and found herself in plenty of space to score a try that, though placed near the posts, saw Murillo fail to convert. Nevada’s Sammi Lyons scored a converted try at 55 minutes to tie the match at 19-19. Nevada was now putting some pressure on Santa Clara, and their nerves were starting to show a bit. One 5 meter scrum to Santa Clara had their scrum half feeding the ball to fly half Michelle Coleman’s right, just out of reach, with the ball landing beyond the dead ball line, forcing another scrum 5 to Nevada. Unfortunately one of Nevada’s forwards was guilty of a second high tackle within the space of five minutes with three quarters of the match played, and it was a third high tackle for that player overall, so she was yellow carded. In the meantime a Santa Clara player left the field with an injury, leaving them with 13 on the pitch. Now it was 14 on 13, and Santa Clara would again threaten to score, pinning Nevada deep into their own end, where they would infringe. 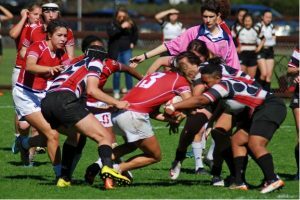 Santa Clara ran the penalty, and Jessica Lew-Munoz would score a converted try to once again put Santa Clara into a lead they would not relinquish. Before the Nevada player could be let back on the pitch two more Santa Clara tries were added. Mariela Murillo took advantage of space to go on a fifty meter run, only to be caught by a faster Nevada back in full flight as well, but Erica Sweet took a pass some five to ten meters from the goal line as she had been running in support, crossing over and setting up Murillo’s conversion kick for another seven points. A few minutes later, near 70 minutes of play having gone by, Michelle Coleman would score after a tackle-ruck situation, taking a pass and dotting down. The conversion failed, and Santa Clara had 38 points on the score board with some ten minutes left in the match, but with Nevada-Reno now back at full strength with their player returning to the pitch after the ten minute sin-binning. Another Santa Clara player would then be injured shortly thereafter, leaving them now with 12 players. Nevada quickly tried to take advantage of the situation, and penetrated into Santa Clara territory, realizing time was short, but that a few quick converted tries might bring them a chance to win. There were some infringements by Santa Clara, defending desperately, but they were making tackles to stymie any attempts to score on Nevada’s part. The horn went off as the forty minutes of time on the score board ended, but I already had notified both teams of three minutes of added stoppage time and to disregard that horn. Into injury time Michelle Coleman made a clearance kick behind the 22, finding touch and setting up a line out after one minute. Another minute of play went by when Coleman, standing deep in her quarter, got the ball in her hands again deep in her 22, but this time the attempted clearing kick went off the side of her foot straight into a team mate’s hands in an offside position up field some fifteen meters. Nevada took the scrum much nearer to the goal line for one last gasp attempt to score, but their possession, and the game, ended with a knock on as I blew for no side. This match leaves Santa Clara and Fresno State clashing head to head in two weeks time for the Division 2 championship, in Fresno. Fresno State has greatly improved in two seasons and might be considered the favorite, and they do have a deep bench. Santa Clara now has to face whether they will have at least 15 ready to play. Hopefully for them the two injured in this match will be ready, and the other two on the sidelines who didn’t play against Reno will be as well. Santa Clara dominated open play and restarts to score 9 tries to UCSB’s 3 tries. Santa Clara’s scrum was dominated and this dominance resulted in a penalty try. Santa Clara B made it two for two as they beat UCSB second side. Two teams that spent 80 minutes ignorantly whining and complaining and in between managed a few passages of rugby. Interesting game moved to a turf field in Vallejo lined for softball and soccer, which necessitated the use of tape for critical lines and resulted in some confusion on my part at least once (and I am being generous to myself). There were lot of physical confrontations and big hits (which were very much for the most part legal) with the game being pretty much even until the deeper Napa team began to find running lanes and gaps into which to drop kicks putting Fresno on the back foot. Fresno stayed in the game mainly due to the efforts of the IRB’s 2005 7s player of the year, who was a pleasure to watch play up close. The game was held during a windy day at Livermore Park’s turf field in Folsom, CA. Marin has been struggling with keeping players healthy and accountable, having to put many inexperienced starters on the field against a strong Mother Lode side. The inexperience and fatigue due to lack of players/substitutes plagued Marin through the game. The Captains were respectful and both teams played a clean game. Despite Marin’s downfall, they held their heads high and were extremely respectful players and a great side to referee. Mother Lode was a great home team to referee for as well. A large and festive crowd witnessed a great high school variety rugby game this past Saturday at Leland High School in south San Jose. United hosted current national high school champion Danville. Danville came up against a very physical United team. United was totally up for the game, with little to no intimidation. At 21 minutes the first and only score of the first half was by my player of the game, captain and #12 Kevin. Half time score Danville 7 United 0. Kevin opened the second half with another long and somewhat individual effort for a try at 4 minutes. At the 8 minute mark Danville’s fullback scored on another long run. United’s primary weakness was on mid field missed tackles turned into long runs due to poor forward support. Danville powerful #8 finished the scoring for Danville at the 12 minute mark. United scored a try at the 32 minutes. The game was played with respect, speed and ingenuity. Thanks to the coaches and captains for showing the respect to themselves, the fans and their opponents. That is what rugby is all about. Lighting up your opposite mark with a strong legal tackle and no dancing or smack talking after. A great day for rugby at Cal Maritime. Life West (LW) was in blue and All Blues (AB) were in yellow. It caused a little confusion at the beginning, both sides would react when I asked “blue” to do something. However, LW took control of the game with good continuity in the open field and scored two tries in the first half. One in the 20 minute and one in the 23 minute. Neither conversion was made. AB did score in the 40 minute of the first half (a penalty try) and made the conversion. Half time score LW – 10 : AB – 7. LW continued the good open field play in the second half scoring four tries and one conversion. One try was scored when LW was short a player. AB was awarded a second penalty try after LW was offside three times (and numerous verbal warnings) while the ball was within one meter of the goal. The final score LW – 32 : AB 12. Beautiful, sunny day as we kicked off at 11:00 am. Very even game with Humboldt scoring a converted try first, Cal scored the next three tries, Humboldt scored two more……kind of all game long, a see saw battle. Humboldt took the lead with 5 minutes to go, 32-31, the crowd went crazy and then Cal scored two converted tries in the last few minutes to put an end to the crowds cheerful excitement. It was a game that lived up to its billing. Jesuit always have a very good squad; Coach Inoke at CKM has built a very strong one as well, and now they are on the radar. It was a special game for me to ref in that no fewer than 10 Land Park Motley Alum were on the pitch for both teams at any given time, sometimes numbering up to 13. The Alum went through our youth and middle school academy at Land Park so it was a game of cat and mouse, what with them being very familiar with this ref’s likes and dislikes. The monsoon proportions of rain resulted in Jesuit hosting this match on its turf pitch. I was looking for that easing flow into the game as it started but no such luck as Jesuit took the start and center George Niethammer made a scything 60 meter run for a converted try prior to the first minute ticking off. Jesuit would score again in the corner by their wing before CKM knew what had hit them. CKM, to their credit, stuck to their gameplan, naturally based on Kiwi rugby as Inoke hails from Wellington. The outside center, very slippery indeed, beat three defenders for a try under the posts and the game was on. And so it went, Jesuit would score, then CKM, who eventually gained the momentum and the lead into the third stanza with brilliant backline play orchestrated by Junior at ten, often times capped off with tries by Zach Neff, flanker. CKM took the lead on a chip and chase by the wing, brilliantly put down in the corner for a try. 36-33 CKM. Jesuit never once backed down or showed any discomfort. They soon gathered the lead with a barnstorming run by prop Conner Bellinger off a ruck, then padded it with a fantastic up and under (remember garryownens?) by Carlos Ramirez, a fortuitous bounce of the ball for the Jesuit wing and his subsequent great catch and dot down. Towards the end, captain Garrett Kay took a ball off the base of a scrum and powered in for his try. Credit CKM, they bounced right back to score a try at the death on another slicing run by Zach Neff. Conversion good. Jesuit wins in a well contested match, played in good spirits. The game was pushed to start a half hour later than normal in an attempt to allow the field to dry as much as possible due to the large amount of rain we have received in the north state. The breeze that replaced the rain Friday and Saturday did just that and the field was in great shape for the entirety of the game. Chico scored first at the 20 minute mark of the half and then put in three more scores to take a 26-0 lead into halftime. Chico scored first again in the second half at the 45th minute and then Reno followed with one converted try at the 71st minute and an unconverted try very late in the game. The final score was 33-12 in favor of Chico State. My weekend got off to a poor start when weather-related road damage scuppered our plans to head up to the Sierra for some cross-country skiing. Mid-morning on Saturday the call came: could I get to Berkeley in time for a 2 pm match to cover for a now injured ref who had been covering for an ill ref. Never one to look a gift horse in the mouth I was soon wending my way through the reconstruction zone that is Santa Cruz county these days and heading into the bright sunlit skies of the Bay. It was a beautiful day at Witter Field, and for the second match in a double-header, Cal was facing Cal Poly. It was fun to see a number of players I remember from their high school years, all of whom have blossomed into robust athletes. Cal Poly’s impressive scrum platform was a serious handful for Cal’s front row for much of the match, and the breakdowns were fiercely contested, with Cal Poly’s flanker and captain winning a couple of outrageous poaches. However, Cal’s intensity in defense, ball protection, and support play gave them the upper hand in open play, and Cal Poly couldn’t contain Cal’s lineout mauls from close range. Many thanks for David Pescetti and Duane Heil for their help on the touchlines. The torrential week of wet weather parted for it knew better than to impede our holy day. The sun shone brightly as kick off approached and it remained that way. The initial 40 minutes were mostly controlled by Cal. Breaking out to 22 – 0 lead in the first 30 minutes. After that momentum swung decidedly to ASU. Unfortunately ASU was only able to manage a penalty kick in those final 10, despite threatening. However, the half time break did not relent up the pressure. The beginning of the second half ASU resumed their pressure and capitalized on that pressure. Putting up a Try and another Penalty Kick to bring the score to Cal 22 – ASU 11. After feeling the sting of the Sun Devil Trident close behind them, Cal went back to their open play-style. Using their speed on the wing they were able to spring for several tries and push their lead. Cal was able to score 4 tries and a conversion in each half bringing their final score to 44. ASU had an impressive second half scoring 13 points. Good luck to both teams the rest of the way. Another sunny morning in Arcata. UC Davis kicked off at 11:00 am, they tackled the Humboldt player, rucked over and through the Humboldt forwards, picked up the ball, five passes and they scored within 90 seconds. They also scored a try in the 3rd minute. And in the 5th and 7th minute and so it went. They have a small pack, but they are ferocious ruckers, good passers, they have a strong backline, shifty runners and they are in shape. Humboldt couldn’t stop them. Humboldt kept their humor and their high efforts. They scored a hard fought try in the 25th minute as well as in the 75th minute, so they never stopped trying (no pun intended). They were coached by my old team mate, Gary Gordon. I loved his upbeat approach, encouraging and never yelling. Of course, there wasn’t much to be yelling about on that day. I received a little bit of a workout (which I needed anyway). This week’s photo is of one of our youngest referees Andrew Stockton as he keeps a close eye on the ladies of Stanford and Chico St. I call it “Stockton at Stanford”. This entry was posted in News on February 16, 2017 by James Hinkin.